As with many of the finer things in life, such as music, painting, and wine, there is an approach to the experience on how to eat an oyster. Then, looking back upon the experience, that usually translates to “I don’t know much about X, but I know what I like.” Not cerebral, but holistic and visceral. That’s fine! You will know if you like oysters or not once you taste a few. Such an approach and attitude are based upon your subjective response to the experience of eating, or drinking, or listening, or viewing a work of art or nature (often the combination of the two). With each experience, though, you bring more to the next experience, and that often translates into evolving likes and dislikes. Want to learn about wine? Taste a lot of wines. Want to learn about oysters? Taste a variety. Of course there is another approach to the experience of art and nature that attempts to formularise the approach and even the terms, so that you can bring more to the experience and theoretically take more away from it – or at least take different things away. So with wine, tasters commonly analyse the tasting experience by looking at the colour of the wine, smelling its “nose,” and then tasting it and analysing its flavours. We try to describe them with equivalencies, we learn words like tannic and dark fruit. We then note the finish or aftertaste, how long and pleasantly it stays with you. Much the same holds true for tasting an oyster. The physical process of eating an oyster is simple: bring the shell up to and parallel with your mouth, and with a small oyster fork, slide the oyster into your mouth and then slurp in the juice from the shell. Or, just as commonly, you can simply tilt the shell and slurp the oyster and its juice into your mouth. Next, you chew it two or three times, so that the flavour explodes onto your palate, then swallow the entire oyster. In an oyster bar or a restaurant and at home, your platter of oysters should be accompanied by a moist towel—now mostly a commercial packet containing a moist towelette—or even an old­-fashioned finger bowl with water and lemon, so you can clean your fingers after (or before) touching the shells and oysters (a nice and necessary little hygienic touch). Like tasting wine, there is a process for more formally approaching the experience of tasting an oyster. Here is how I see it as a variation of look, smell, taste, and follow‑up. Starting with the oyster already on its half shell, the look, the appearance, can tell you the size and type, but you will also note colour, from translucent to pearl­-like to green around the gills to blue-­green. You will also note if the oyster is plump and smooth or perhaps flat. All of these are okay. They are identifiers and differentiators and help you pick what you like. The smell, the odour, or the aroma (a word with better connotations than odor or smell) of an oyster is a treat. You are smelling the sea in its various flavors and intensities, depending on where the oyster comes from. The smell should be super‑fresh; its power can be mild to strong. 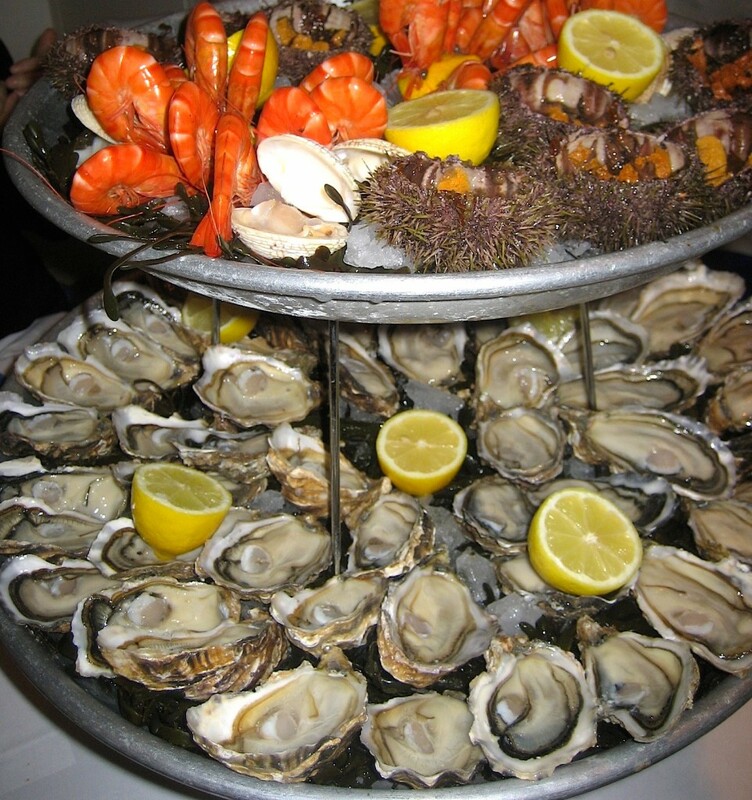 When I am in Paris and I smell an oyster, I can be transported, Proust­like, to the seaside far away and back to a childhood or adult experience. Salinity is a telling characteristic of an oyster, and it appears on the nose and on the palate. It can be mild or strong and in some cases powerfully iodized. All salts do not taste the same. On the palate, some of the operative taste words are crisp, mild, briny, buttery, sweet, milky, nutty, earthy, grassy, fruity, citrusy, watermelony, melony, creamy, clammy, clean, and bright. But here words are insufficient to describe the myriad of subtle flavor overtones that come from each oyster’s habitat, its terroir, and there are so, so many. Also, note how the flavors change on the palate, perhaps from initial saltiness (but what kind of salty?) after the first bite to a sweetness (what kind of sweetness?). And, just as the second sip and impression of a wine is influenced by the first and can be different, the taste of a second oyster is subtly different from the first, and you can perhaps pick up new or differently modulated flavours. The texture is telling as well: soft, crunchy, chewy, bitable, smooth, watery, firm, hard, airy, or creamy. The finish or aftertaste brings a great deal of the satisfaction experienced from the taste of an oyster. And, again just like wine, the longer the finish, the better. The minerals and fats in the oyster reveal themselves in the finish, as do evolving and lasting flavors. The more complexity, as with wine, all the more telling and often more satisfying. Mireille Guiliano’s latest book, Meet Paris Oyster, A Love Affair with the Perfect Food , is an engaging exploration of the Parisian love affair with the world’s most sensuous shellfish – and the good life in general. It centers on Huîtrerie Régis, a tightly packed oyster bar in the heart of the City of Light, with an opinionated owner and a colourful cast of regulars. Part cultural journey, part cookbook, and part slice-of-life play, she introduces readers to the appetites (gastronomic and otherwise) of Paris and its people. Beyond Huîtrerie Régis, the French oystermen and the other characters involved with the pursuit of the oyster in France, Mireille Guiliano shares information on where to find the best oysters around the world, their substantial nutritional value, the best wine pairings with oysters, and a dozen mouthwatering recipes that will have readers craving, buying, and preparing oysters, with confidence, for themselves and their loved ones. Take a sneak peek at Mireille Guiliano’s “Meet Paris Oyster”.